Central Kitsap incorporates several communities and cities in the central region of Kitsap Peninsula, including Silverdale, Keyport, Bremerton, Brownsville, and Port Orchard. Homes for sale in Central Kitsap vary widely in size and price, but generally include single family residences and townhouses in new subdivisions, gated neighborhoods, and golf course communities. Residents of Central Kitsap are truly in the center of things and enjoy short commutes to the Naval Bases, Kitsap Mall, Central Kitsap schools, and plenty of boating or beach activities on Puget Sound. 3 Beds | 2.5 Baths | 1992 sq. Ft.
4 Beds | 2.25 Baths | 1839 sq. Ft.
4 Beds | 2.75 Baths | 2486 sq. Ft.
5 Beds | 3 Baths | 3669 sq. Ft.
3 Beds | 2.25 Baths | 2284 sq. Ft.
3 Beds | 2.5 Baths | 2916 sq. Ft.
4 Beds | 2.5 Baths | 2243 sq. Ft.
2 Beds | 2 Baths | 926 sq. Ft.
3 Beds | 2 Baths | 1773 sq. Ft.
4 Beds | 2.75 Baths | 3074 sq. Ft.
4 Beds | 2.5 Baths | 2671 sq. Ft.
4 Beds | 2.75 Baths | 2769 sq. Ft.
Blue Summit Realty has the most accurate and up to date Central Kitsap real estate listings on the web. Currently there are 18 homes for sale, and 6 vacant land properties in Central Kitsap. Of the 26 total Central Kitsap residential listings for sale 0 are bank owned, 0 are short sales, 0 are new construction, and 0 are townhomes. The price ranges from $270,000 to $0 with a median list price of $450,363 and median sold price of $352,110. 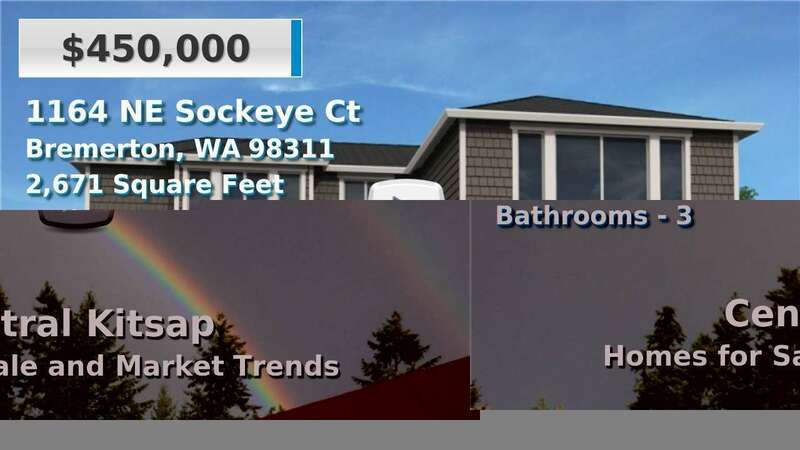 Make sure to refine your Central Kitsap real estate search by property type, price, square footage, bedrooms, bathrooms and more with the search tool above or view the Central Kitsap listings on our interactive map. Our Central Kitsap real estate listings were updated 1 minutes ago.